Ralph Fiennes second film from the director’s chair follows in the steps of his debut ‘Coriolanus’ by returning to one of our most famous writers, although this time it’s to chronicle fact and not fiction. ‘Coriolanus’ was one of Shakespeare’s most brutal tragedies, and Fiennes expertly transferred the story to modern times; ‘The Invisible Woman’ switches his attention to Charles Dickens, and an affair he had with a young actress, Nelly Ternan. I often find it difficult to get into period pieces but this is very, very good. 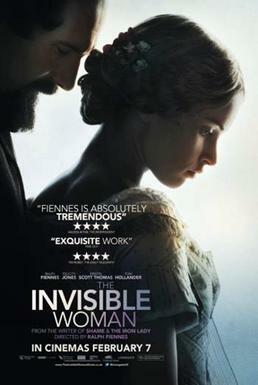 Fiennes makes an excellent Dickens, but the star of the show is Felicity Jones as the young actress, carving herself a little niche as a younger girl who has affairs with older woman, following on from ‘Breathe In’ with Guy Pearce last year. She manages to convey a sense of fragility throughout, but with a clear notion that she knows exactly what she’s doing – it’s a difficult balancing act and Jones manages it well. The unsung hero of the piece is Joanna Scanlan, as Dickens shunned wife, who perfectly embodies a women who feels her usefulness is gone now that she has had children. Scanlan is best known to me for her comedic roles, namely in The Thick of It, but she thrives here in a more dramatic performance. The period setting is sumptuous, with the 1800’s being recreated with stunning detail and beautiful costumes, which help to bring a fairly straightforward story to life. In terms of the title, it could refer to a number of characters but its most appropriate to Jones’ Nelly, who’s status is never really acknowledged by Dickens, for fears of his infidelity being exposed in a period where marriage truly was for life. This is an excellent drama, very well made with an engrossing story at the heart of it – fans of period pieces will lap this one up.